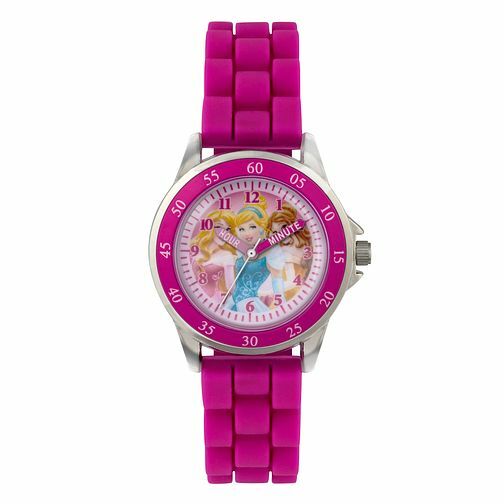 Make learning to tell the time fun, with this cute Disney Princess time teacher watch. Featuring an easy to read dial, stainless steel case, vibrant pink bezel and pink rubber strap. A great gift idea. Children's Disney Princess Time Teacher Pink Strap Watch is rated 4.0 out of 5 by 2. Rated 5 out of 5 by Anonymous from Happy 5 year old I brought the time teacher watch for my daughter, she loves it! She thinks it looks good.. and it’s also helping her to tell the time! Great service, ordered for collection in store, very straight forward service! Rated 3 out of 5 by Anonymous from Not the best This watch is fine, girly and my daughter has learned to read the time better. The fault, is the numbers in white on casing rubbed off within 4 days of wearing.